When we were running the family catering business, we often repeated the phrase, “The eyes eat first” – meaning that our food had to look good as well as taste good. “The Nourished Kitchen: Farm-to-Table recipes for the Traditional Foods Lifestyle” is a feast for the eyes as well as an inspiration to savor traditional recipes with a modern twist. I have the pleasure of receiving a review copy as we head into the perfect time to experiment with these farm to table options. 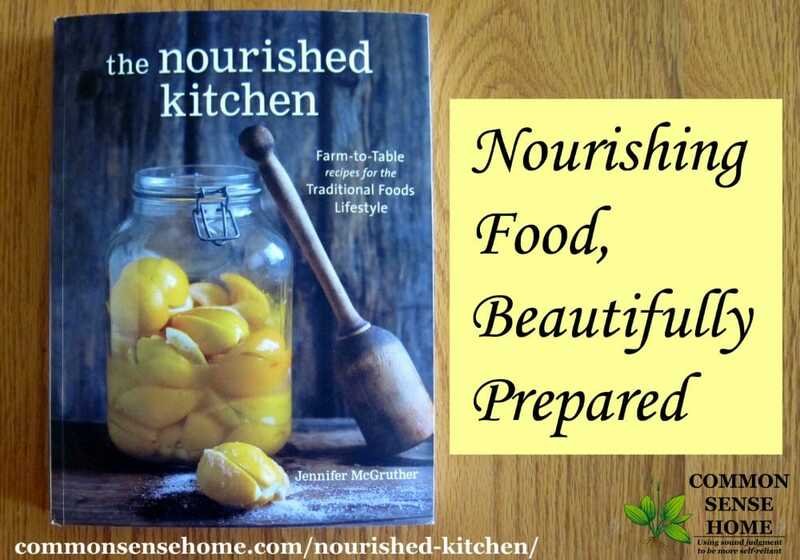 The Nourished Kitchen cookbook is written by Jennifer McGruther of www.nourishedkitchen.com, an award winning traditional foods website. Her years of managing a farmers market and teaching traditional food preparation shine through in this beautiful new book. Recipes focus on seasonal cooking of locally available foods, and are based on the Weston A. Price traditional foods diet. You won't find pre-packaged products assembled into “recipes”. This cooking starts with real food. Jenny offers detailed cooking instructions, and also provides insight into why and how the recipes were created. There are charts and gorgeous full colored photos sprinkled throughout the text. I would love to win this book. I’m trying to incorporate more foods and more education would be a big hep. I love Jenny’s blog, I’m sure her book is lovely as well. What is the most exciting recipe in the book? The one you wanted to try first? I really want to try the braised short ribs with sun dried tomatoes and herbs, because my current rib recipe is just so-so. I also *need* to try the different liver recipes, as we have a ton of liver in the freezer because we bought half a cow. Would love to have this book & be able to share with friends & family. 2. The affordability of locally raised meat products. Produce -not a problem- but the other two present a challenge! I hear you! After nearly 8 years here I have finally tracked down local sources for most of our meat, but wow – the prices do make me cringe a little. I make sure we get multiple meals and use every part of the critter. Sounds like a great book! Thank you for the opportunity! Eating “real” food now, this book would be a great help to me. I would love to have this book! This looks like something I would enjoy. I love to ferment and make the best use of things around me. Thank you for this giveaway! Looks like a wonderful book. I was just looking at that book yesterday! I love it! Fingers crossed on winning this! We’ve been working on incorporating more whole foods, fermented foods, and high-nutritional value meals for our family as we’ve seen great benefits to our son who is autistic. So thankful for resources like this! Looks like a great cookbook for anyone’s collection! It would be a wonderful addition to our lifestyle to have this book!! I have soooo many food allergies – this would be a great help. Thank you for the opportunity!!! 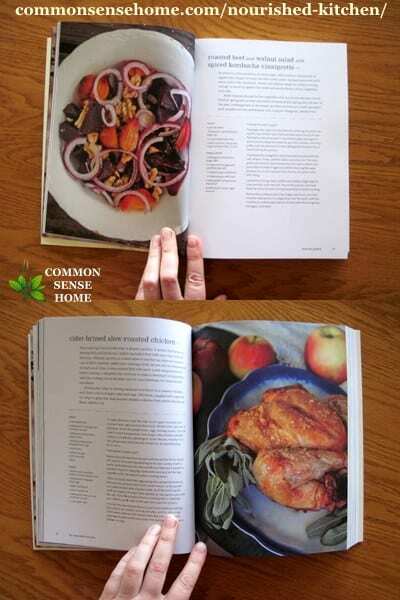 That looks like a very beautiful cookbook! I so love recipes with photos that really inspire you to make the food. I want to know how to grow Cilantro so that I can continually harvest it daily for seasoning, salads etc.? The problem here in the desert is that it bolts (goes to seed) so quickly that we never have enough for our needs. Any ideas? I know it doesn’t like the heat at all – wondering about shade cloth to block some sun, or creating a microclimate with other plants nearby to provide shade and extra water in the topsoil. I was just reading in “The Lost Language of Plants” about how various trees create whole ecosystems in the desert, creating oases of life where there was none. Maybe some of Geoff Lawton’s work would help? He has a site that discusses how he turned an area from desert to oasis in 4 years. Also, how do I find and purchase good raw milk in a state where that is deemed illegal? I can occasionally obtain goat’s milk when I travel to a friend’s place a few towns away, but have never been able to find raw cow’s milk . . . and I really would like it for making raw kefir and cheeses. Should I be worried about purchasing wheat berries locally? What do you mean by “worried”? This would be a great book to have. Local eating is so hard in the mountains of Colorado. We can’t grow much in the garden. I’m a vegetarian, but I get farm fresh eggs as protein. How do you eat local and in season in such cold areas? We start our summer gardening at the beginning of June and we’ll lose everything by September due to very windy frosts. My cold weather crops were in the ground last fall and still aren’t ready for harvesting. The lettuce and spinach I can pick a few leaves from in a week or two, but produce is hard to grow here most of the year. The book “Four Season Harvest” by Eliot Coleman is a great resource for keeping some sort of production coming from the garden even under very cold conditions. We are trying to use more local produce both from our own yard and gardens and foraging and from others as we find more links and resources. I’d love to have a book like this! I’ve got the nourishing part down but i think my family would appreciate it if I got the beautiful part going to. lol – I know what you mean! This looks like a lovely book. I love the concept. Like a previous post I find it hard to find local food like meat and dairy that is affordable. I grow my own veggies and some fruit and we do raise some animals for meat. id love to find out how to use those preserved lemons! Would love to win the book. Can’t think of a question. Would love to have this book to help us get back.to the ways of the great generation my grandparents were a part of . I would really like to do more foraging but I’m a little nervous about actually eating the plants. Your local cooperative extension office should have staff that can help you make a positive ID. There are also a growing number of foraging groups around the US. I don’t have any questions, but I would love to win this book! Seems like a very handy book to have on hand in the kitchen. Thanks. I would love this. I am hoping to work more seasonal meals into our menu this summer and I feel this would be a great start. I’ve had my eye on this! It is so beautiful and your review only makes me want it even more! I have a large garden this year and am looking for recipes to make healthy and great tasting meals for my family. I would love to win this book! This would be a wonderful addition to my family’s kitchen! This looks like just the cookbook I’ve been searching for! Thank you and The Nourished Kitchen for doing this giveaway! My library already has a copy and it’s a great book! This would just be an awesome addition to my simpler life and better eating makeover. I enjoy reading all about your ideas and creations. There is a whole world out there waiting to be a better idea. Thanks for your input. Thanks so much for the two of you doing this! What are the fruits/veggies to look for around this time of year? Would like to try making jam for the first time from produce from the farmers market – could use some tips on what is “in season” right now. Epicurious has an interactive Seasonal Ingredient map that will help you find what’s in season where you live. I would love to have this book! I am a mother of three, and I’m working really hard to learn how to cook real food… This would be so wonderful! I am a SAHM of 4 kids, ages 3, 5 1/2, 7 1/2, and 11. We make EVERYTHING at home because of some pretty major food allergies / sensitivities, and I am always looking for more new things to make and new recipes to try. I am teaching our children about the importance of food as nourishment for our bodies and that the preparation is just as important as the ingredients. Cook with love! I already made a recipe (spinach and potato soup) from this book, so I would love to win a copy! Her cookbook looks amazing!!! We love eating with the season in our home. Any tips on making kombucha? Would LOVE to have a copy of this cookbook!!! I’m slowly but surely venturing out there and trying to find new recipes to incorporate our homegrown, ORGANIC veggies and meats we raise and process ourselves! I try to frequent farmer’s markets as much as possible. Many are not certified organic farmers due to costs, but then from talking with them, I worry about what I am actually buying from them. I do find some of them seem to not really understand my questions or that they are mislabeling and mis-communicating facts about their foods. I am wondering if anyone has tips on getting the most honest and direct answers to my questions…such as: are your animals pastured or fed corn or soy, are the grains gmo, is this dairy or beef grass fed or grass finished, how do the pesticides you use on your vegetables differ from those in a grocery store (these are just examples of questions to which I seem get unclear answers). I feel like I am direct and clear, but maybe I am confusing and need to simplify my questions. Keep asking until you find someone who understands what you’re asking. In my experience, a typical vendor won’t even understand your concerns, but those who grow organically/sustainably will. can’t wait to get a copy of this book. tried to buy it on amazon today, but only paperback was available. i want the hard copy so i can pass it down to my daughter some day! We’re trying to incorporate local fresh foods into our diet but we’re having so much trouble making it work on our budget. I know in the long run with less sickness and being healthier its cheaper but when you seriously dont have it to spend you just dont. What’s the most important thing to make sure is local organic if you cant be sure you can do it all? You may find the post “Practical Ways to Eat Well When You Can’t Afford Organic Food” useful. Thank you so much! I just got done reading it and it was very helpful! I love all the nourished kitchen recipes posted on facebook! Im a new vegan & id love for this to be my first vegan cookbook! Just a warning, the book is not vegan. There are many recipes for animal based products. Thanks for a wonderful opportunity to win a book I’ve been wanting. And nice to find your awesome blog too! Your book is on my wish list! I enjoy reading everything you post thanks so much for sharing your knowledge with all of us! I really appreciate a review that tells me something other reviews haven’t done: how the book is structured. I already knew that I wanted this book, but this review gives me a better idea of what’s in the book. This is the way I cook, and NourishedKitchen.com is already one of my mainstay recipe sources. Brava, brava all around! I can’t think of a question but I’m always looking for new ideas & recipes to cook seasonally =). Thanks for the giveaway! I’m interested in learning how to use ‘perennial’ onions, please. You should be able to use perennial onions much the same as standard onions or shallots. My husband and I have been converting to “real food” cooking for most of the last year. This cookbook looks beautiful and filled with recipes that I can’t wait to try. I love your blog. This book looks so interesting. I can’t wait to check it out! This book looks fabulous! I have been reading the nourished kitchen blog for a few months, but this book is lovely! Would love to win a copy! It’s in my amazon cart as we speak…thanks for the chance. I love to eat real food. But i have an VERY busy 18 month old. I swear I just don’t have the time to cut veggies! We manage plenty of fruits, but I have a hard time with veggies. Do you have any time saving tips? Thanks! Check out the site Momables. Lots of great time saving food tips for busy moms. As a beginner, I can use all the help I can get! how have you found out about good reliable local farms to you besides word of mouth?? we’re moving and i have no idea where to start with finding local food! Wisconsin has a farm fresh atlas with a map of local producers. You may be able to find something similar in your area. Jenny’s blog is one of my most favorite and her recipes are tops. So glad she has a book out now. This would make a wonderful addition to our kitchen. As a momma of 5 kids I try my hardest to make nourishing meals and alway try to make wise food choices!! I have been trying to get my hands on this fabulous book for weeks now, but every time I get a minute to log in to Amazon it’s already sold out! As the mother of type one diabetic child, cutting out the processed junk is so important to us and I just know the recipes in this book will be so helpful and a great boost to my slowly growing collection of whole / real food recipes. It’s been so popular they’ve just ordered a second printing. I’ve been wanting to get my hands on this cookbook! I have no questions really, but I’d totally love to have this book. 🙂 Your blog looks so interesting, too! I think I can learn a lot here! I’m really curious about this cookbook. I love the recipes on the Nourished Kitchen website and am hoping that most of the recipes and information in this cookbook are different enough from those in Nourishing Traditions. I’d love to learn more about healthy wholesome living! I wish I had the life of cooking you have! I’m a single mom teaching my small person the value of healthy, natural eating. Thank you for a beautiful cookbook and wonderful blog. I LOOOVE preserved lemons! I am loving my experiences with natural fermentation, brines, and salted lemons yum. I’d be so lucky to get a copy! Love all the ideas! Thanks!